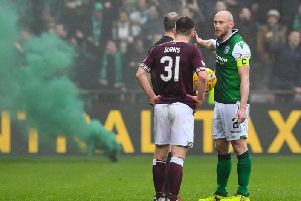 Hibs were flying high after a magnificent seven past sorry Livi fired them back into third place in the SPL and put arch-rivals Hearts firmly back in their sights. It was a further endorsement of manager Tony Mowbray’s results following his team’s 3-0 crushing of Rangers at Ibrox in the Scottish Cup the previous weekend. By the time referee Charlie Richmond signalled the end of proceedings, perhaps the only disappointment among the Hibs fans was that they hadn’t witnessed their side smash the record winning margin in the SPL. For a long spell it looked as if the recently-installed scoreboard at Easter Road might have to cope with a double figure scoreline as shot after shot rained in on Roddy McKenzie’s goal. It was purely down to an inspired display from the former Hearts keeper that the hapless Lions avoided further humiliation. The victory not only lifted Hibs above Rangers but, coupled with the Ibrox club’s 2-0 defeat by Aberdeen at Pittodrie, hauled them level with Alex McLeish’s outfit in the goals count. With new signing Chris Killen adding a further dimension to Hibs’ play - the big Kiwi was happy to perform with his back to goal and link things up. And he again showed his eye for goal, bundling the ball over the line for a close-range opener after McKenzie had twice thwarted Garry O’Connor. Mowbray had given his side a dressing down only a couple of weeks previously for a lack of what he described as “scruffy goals”, those scored from a couple of yards out by whatever means. There were no complaints on this occasion, however, as Derek Riordan fired home his 14th goal of the season from the penalty spot after he was brought down before O’Connor slid in at the back post to claim the third four minutes after the interval. At that stage it was clear it was only going to be a matter of how many. Ivan Sproule saw a low shot blocked by McKenzie, another stopped on the line by Greg Strong and a third saved by the keeper, only for the ball to break to Riordan to claim his second of the game. Livingston’s Dave Mackay deflected a Stephen Glass corner into his own net and then substitute Steven Fletcher completed the rout with two goals in the last couple of minutes, but only after Glass had hit the post and then lashed over from ten yards. Hibs: Brown, Whittaker, Caldwell (Konde 72), Smith, Murphy, Killen, Stewart, Glass, Riordan, Sproule (Konte 68), O’Connor (S Fletcher 55). Subs not used: Hogg, Shiels, McCluskey, Malkowski. Livingston: McKenzie, McNamee (Snodgrass 67), Pinxten, Strong, MacKay, Lambert (Adams 72), Walker, Dair, Tierney, Hislop (Scott 46), Hoolahan. Subs not used: Dorado, Roy, Vincze, Dorrans.